Did you know that there are more than 100,000 children living in poverty in Alaska who own zero books? Together, we can change that statistic and improve the future for Alaskan youth! Credit Union 1 is raising funds for Best Beginnings and their efforts to get a book into the hands of every Alaskan child. By partnering with Dolly Parton’s Imagination Library, Best Beginnings currently sends a book to over 19,000 children in our state each month. Let’s boost that number to help even more kids! With every $5 raised for Best Beginnings, two more books can be purchased for an Alaskan child. Donate the spare change from your check deposit, the few extra dollars in the bottom of your purse, or the money you would have otherwise spent on fast food or coffee. Your generosity will help put a book into the hands of a local child, which increases their ability to learn and reduces their likelihood of committing crime. By exposing children to books, they’re also more likely to graduate high school and land a higher paying job in the future! In a state where 1 in 5 kids doesn’t graduate high school, the power of your support could keep a child in school and on the right track for success. Credit Union 1 makes it easy to donate both in-person at any CU1 branch or via an Online Access transfer to 457311 S1.6. 100% of funds raised will benefit Best Beginnings and Alaskan youth! 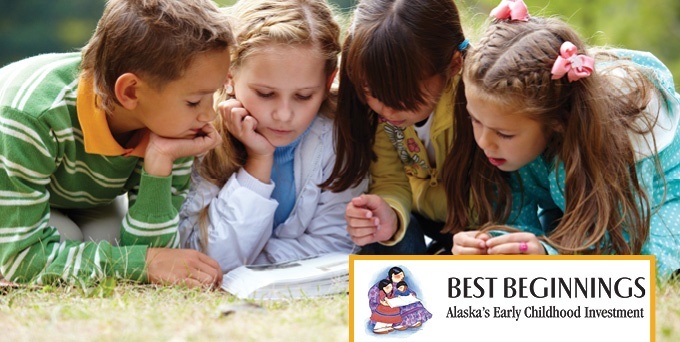 Give Alaskan families the gift of reading together and make a donation today. For even more ways to help your local community, visit the Community tab of cu1.org. You’ll find opportunities to donate, volunteer and get involved in a better Alaska for all!